In December, 2010 through January, 2011 I embarked on a six week audio expedition across Nepal and India with 15 other audio enthusiasts as part of Greg Simmons’ GE-OS project. Supported by DPA microphones and TC Electronic interfaces (facilitated by Amber Technology), we trekked, rode elephants and camels, bussed, sailed and trained across these exotic countries, recording anything that cross our path. GE-OS, or Guerrilla Ethnomusicology – Open Source, is a project started in 1998 by location recordist, AIM lecturer and Audio Technology founder, Greg Simmons. 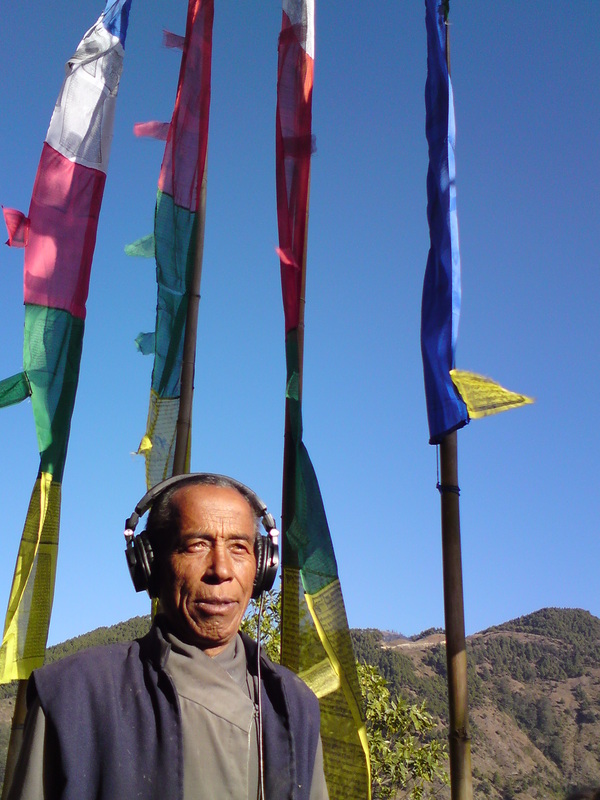 Since its creation, Greg has taken a group of fellow audio lovers across Nepal and India once a year, with help from Nepali guide and coordinator, Dil Gurung. The aim of the project is to record traditional and contemporary musicians across the world, each improvising over a number of pre-programed backing tracks, put together by Jamil Khuri. Eventually, stems of these recordings will be made available online, under a Creative Commons License, for people to use as they see fit. 2. A Day in Studio A – Sarod, Tabla, and… an iPhone? 6. Elephants, and Tigers, and a Rhino. Oh, My! Every chance i get I will add a new entry featuring recordings that were made on the expedition. Rendered from REAPER at 16bit, 320kbps MP3 using LAME encoder. * Side signal given 2.2dB more gain to compensate for difference in microphone sensitivity and maintain correct stereo imaging. ** High pass 24dB per octave filter set at 50Hz, Q of 0.71 and low pass 24dB per octave filter at 16kHz, Q of 0.71. *** Dither to 16bit, ‘red’ mode, with ‘psycho power’ set at 6. Unfortunately, due to the limits of internet streaming speeds, I’ve had to limit the recordings to MP3. The linear phase EQ is in place to remove some of the artefacts that occur when using the MP3 format, doing this results in a better sounding file in my (and many others) opinion. I would love to be able to show you all the 24/96 recordings but it just isn’t practical.